...and a little sun in my room is all I needed to take these pictures, all thanks to this post which I happened to run into yesterday! Next thing I'll try is to built my own light box set-up (as in this post and this one), though I'd like to come up with something I can store away easily. We don't have that much room in our small apartment to have boxes sitting around... I think this post might be a good starting point. 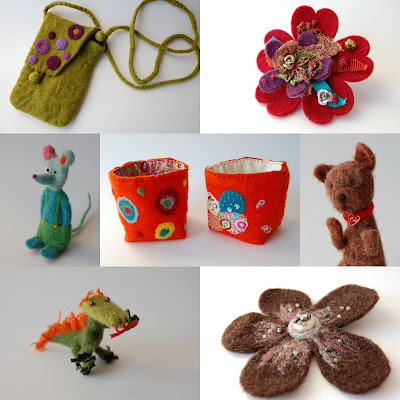 The above pictures show some of my needle felting projects (except for the flower brooch in the top right hand corner, which is just embroidered felt). The orange baskets in the middle are the ones I mentioned in an earlier post.